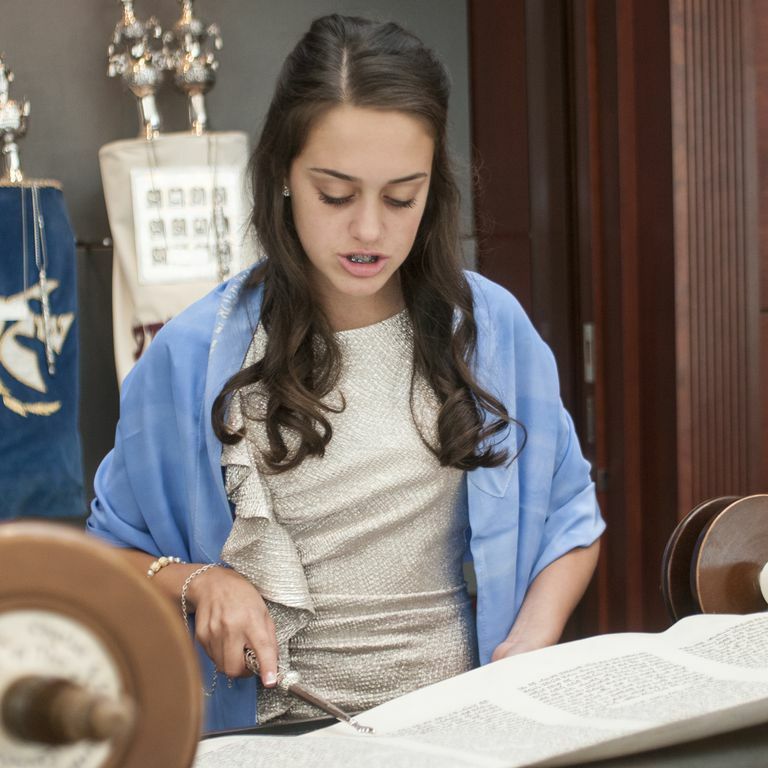 What It Means to "Become a Bat Mitzvah?" Bat Mitzvah literally translates as "daughter of commandment." The word "bat" means "daughter" in Aramaic, which was the commonly spoken vernacular language of the Jewish people (and much of the Middle East) from around 500 B.C.E. to 400 C.E. The word "mitzvah" is Hebrew for "commandment." The term "bat mitzvah" refers to two things: it is used to describe a girl when she comes of age at 12-years-old and also refers to the religious ceremony in more liberal Jewish communities that accompanies a girl becoming a Bat Mitzvah. Often a celebratory party will follow the ceremony and that party is also called a bat mitzvah. Performing Mitzvot: Jewish children are not required to perform mitzvot (plural for mitzvah, meaning "commandments"). While they are encouraged to fulfill as many mitzvot as possible, the commandments are not obligatory until a girl becomes bat mitzvah. In traditional Jewish practice, a girl who has become bat mitzvah must observe mitzvot just like any adult woman. These include, but are not limited to, mitzvot such as lighting Shabbat candles, fasting on Yom Kippur and performing acts of tzedakah (charity). Ethical Responsibility: While not all Jews observe mitzvot, all Jews do recognize that when a girl becomes bat mitzvah she has reached the age of moral and ethical accountability. Religious Services: Amongst Conservative and Reform Jews, a bat mitzvah has the right to participate in leading a religious service, read from the Torah and also counts in a minyan. A minyan is a gathering of at least ten men (and/or women in the liberal movements) of bar/bat mitzvah age or older. It is required to perform a full prayer service. Legal Rights: According to traditional Jewish law, a girl who has become bat mitzvah has the legal rights of an adult, such as the right to own property or enter into a contract. Marriage: In traditional Jewish law, a girl can technically be married when she becomes a Bat Mitzvah. However, both ancient and modern sources recommend 16 to 18-years-old as the earliest point when a girl should be married. Many Jews talk about becoming a bar mitzvah as "becoming a man" and becoming a bat mitzvah as "becoming a woman," but this is not correct. A Jewish girl who has become a bat mitzvah has many of the rights and responsibilities of a Jewish adult (see above), but she is not considered an adult in the full sense of the word yet. Jewish tradition makes this abundantly clear. For instance, in Mishnah Avot 5:21 13-years-old is listed as the age of responsibility for the mitzvot, but the age for marriage is set at 18-years-old and the age for earning a living at 20-years-old. Hence, a bat mitzvah is not a full-fledged adult yet, but Jewish tradition recognizes this age as the point when a child can differentiate between right and wrong and hence can be held accountable for his actions. One way to think about becoming bat mitzvah in Jewish culture is to think about the way secular culture treats teens and children differently. A teenager below the age of 18 does not have all of the legal rights and responsibilities of a full adult, but she is treated differently than younger children. For instance, in most U.S. states children can legally work part-time once they are 14-years-old. Similarly, in many states children younger than 18 can marry with special parental and/or judicial consent. Children in their teens can also be treated as adults in criminal proceedings depending on the circumstance of the crime.